By definition and necessity, a fortress is forbidding, unwelcoming. For good measure, the Gabba, the bastion of the Australian cricket team, is bordered by Vulture Street. This unprepossessing modern stadium may not stir emotions and enthuse romantics like the storied grounds of Melbourne, Sydney and Adelaide, and others the world over, but its very mention strikes apprehension, even fear, into the hearts of visiting teams. It is unsurprising the vast majority of Australian Test series start at the Gabba. This is principally because of weather considerations. It is the most northern of the established Test venues and allows pitch and general ground preparation in advance of the others. Furthermore, the "big-ticket" Tests have traditionally been Melbourne on Boxing Day, Sydney at New Year and Adelaide on Australia Day. The convention has served the Australian team well. To use the vernacular of the contemporary dressing room, they own the ground. Indeed, Australia have won 37 of 59 Tests at the Gabba since 1931 and lost only eight, and none since 1988-89 when Viv Richards celebrated his 100th Test match by leading West Indies to a nine-wicket victory with a day and a half to spare. No other mainland ground offers Australian teams such promise and their opponents such discomfort. Joe Root will be painfully aware that Australia have won the first Test in seven of the past 12 home Ashes series and lost only twice. Significantly, the defeats came at times of conflict - the World Series schism in 1978-79 and in 1986-87 in the wake of the South African rebel imbroglio. For the uninitiated, Gabba is a contraction of Woolloongabba, a suburb three kilometres east of the Brisbane central business district and a probable corruption of Wulunkoppa, an Aboriginal name for what was once a swampy parkland. 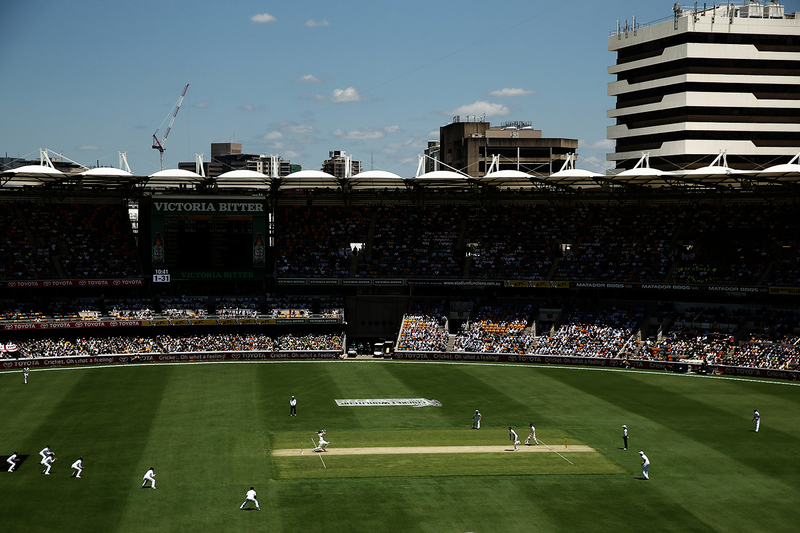 Not even diehards refer to the "Brisbane Cricket Ground". "The Gabba" has become a precious part of the language of the glorious game - or lingo as Queenslanders are wont to say. And it became etched in the psyche of enthusiasts the world over when it so famously facilitated the rebirth of Test match cricket in December 1960 after the drudgery of the 1950s. The peerless batsman and administrator Sir Donald Bradman did not mince his words when he spoke privately with two of the game's most astute leaders, Richie Benaud and Frank Worrell, before the five-Test series between Australia and West Indies in 1960-61. Renowned for his clarity of thought and practicality, Bradman was convinced that a series of exceptional enterprise and entertainment would reinvigorate Test cricket and re-engage the people. To his unbridled delight, a season of goodwill memorably described as a "very beautiful series of cricket" by the West Indian batsman Peter Lashley, began with the first tie since Test cricket began in 1877. Within weeks Bradman had commissioned Ernie McCormick, the Australian fast bowler of the 1930s and a prominent Melbourne jeweller, to craft the Frank Worrell Trophy for future competition between the teams. A cursory glance at the scoreboard of the first tied Test suggests the Gabba square has always favoured new-ball bowlers: the legendary left-armer Alan Davidson took 11 wickets and the charismatic Wes Hall nine. However, there was a time when batsmen had a number of other challenges to deal with. 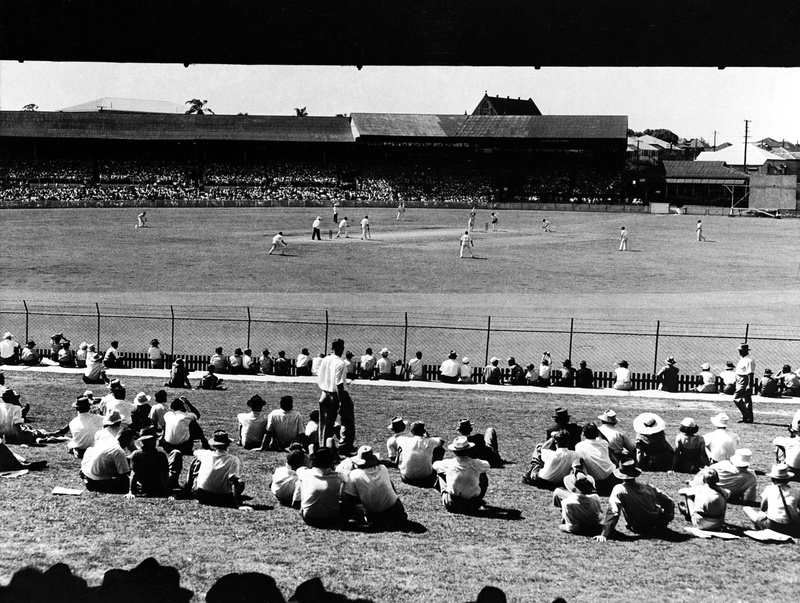 During the 1930s and 1940s, the Gabba was renowned for wicked sticky wickets, which affected four of the first seven Tests after the then Australian Board of Control for International Cricket ended its brief association with the Brisbane Exhibition Ground. 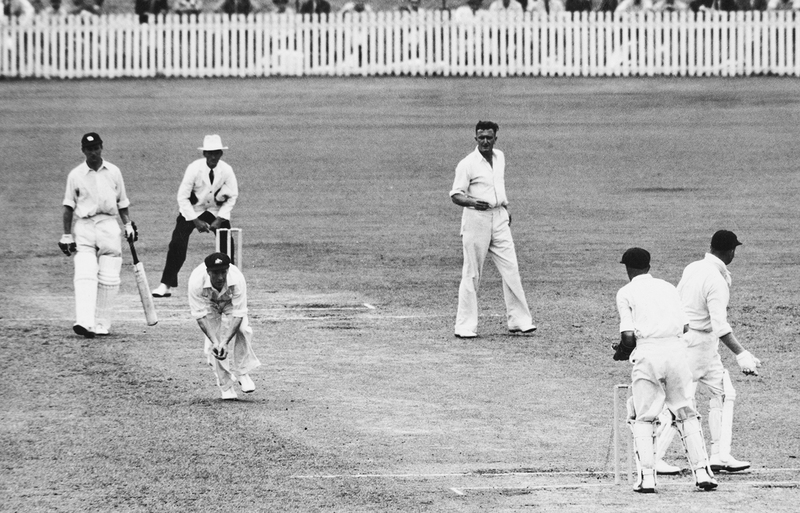 Australia were routed for 58 - their second lowest score in the 20th century - when England triumphed by 322 runs in Bradman's first Test as captain in December 1936. Subsequently it was visiting teams that were stranded on treacherous tracks: England lost 15 wickets in 210 minutes in the wake of storms and flooding in 1946-47, and India were routed for 58 and 98 in their first Test with Australia the following year. England were also the victims of the last sticky wicket in 1950-51. After Australia scored 228 on a good wicket, England declared at 68 for 7, before Australia did at 32 for 7. As a consequence of an extraordinary undefeated 62 by Len Hutton batting at No. 8, England managed 122 in their second innings but lost the Test by 70 runs. While the sticky wickets may have faded from memory, curators, captains and coaches alike ritually prepare for disruptions from dramatic lightning flashes, hailstorms, torrential rain and flash floods, given Brisbane's subtropical weather and its history of late afternoon storms. In a Test match against West Indies in 1992-93 the helmeted Australian 12th man Dean Jones emerged from the safety of the dressing room to run three helmets to ground staff, who risked injury laying the covers as hailstones the size of golf balls pounded the ground. Four years earlier the curator Kevin Mitchell Sr saved a limited-overs match with New Zealand from being abandoned by dramatically running onto the ground ahead of a tractor and compelling the umpires to stop play. By the time the umpires and players reached the boundary the Gabba was awash. The many and varied challenges wrought by the weather and the fact that the critical first Test of a series is invariably played at the ground has guaranteed the Gabba curator a significant public profile. Certainly this was the case in November 1974 when the then Lord Mayor of Brisbane, Alderman Clem Jones, a member of the cricket ground trust, sacked the curator eight days before the first Ashes Test for rolling the pitch sideways. He then set aside his mayoral robes for dungarees and took it upon himself to prepare the surface. Later he seemed untroubled by criticism that the bounce was uneven at one end. History shows that the pitch he fashioned provided an ideal platform for arguably the most lethal of all fast-bowling pairings, Dennis Lillee and Jeff Thomson. With Australia victorious by 166 runs and one up in a six-match series they were destined to win 4-1, the trustees appointed Mitchell to the position of head groundsman. It proved an inspired decision and he served with distinction until 1990-91, when he was succeeded by his son, Kevin Mitchell Jr, who has announced he will retire after the first Test of the Ashes series this summer. While Mitchell Sr often fielded questions about the high drama that ultimately led to his appointment, Mitchell Jr has lost count of the times he has been asked by scribes and spectators alike for an explanation of Australia's dominance at the ground. He is proud of the world-class pitches he has produced and ascribes the success of Australian teams to a liking for a true, hard and consistent surface "providing a bit for everyone with pace, seam, bounce and turn". That he has protected his patch with aplomb and not had to confront the challenges associated with drop-in pitches has given him great comfort. That Queensland winters generally are gentle and there is less football traffic than on other grounds is a bonus. Australia have not lost on Mitchell Jr's watch and boast a 78% winning record - 21 of 27 matches won and six drawn. Indeed, only two of the past 13 Tests have been drawn - against England in 2010-11 and South Africa in 2012-13. The incomparable Allan Border, the second longest-serving Test match captain in history and a resident of Brisbane since the 1970s, wholeheartedly agrees with Mitchell Jr. While not discounting the impact of the enervating heat and humidity on visiting teams, Border is convinced the pitch is the main ingredient for Australia's success at the Gabba. "The wickets are hard and this traditionally suits Australian cricketers who are reared on hard surfaces - on malthoid, cement and matting," says Border. They are new-ball wickets with the ball coming on and they suit our cricket best." These can be confronting conditions for visiting players, especially if they come directly from the bone-dry, slow and low pitches of the subcontinent and have a limited time to acclimatise. In less hurried days touring teams invariably played a four-day game on a pitch adjacent to the Test strip the week preceding the match. This provided a priceless opportunity for players to adjust to the condition of the square, weather, the inevitable changes to water and food, settle into the dressing room, and free the mind to monitor biorhythms and prepare for the stern test ahead. Mike Brearley's England visitors 39 years ago were the last to enjoy such a generous arrangement. First they accounted for Queensland by six wickets and then overpowered Australia and their new captain Graham Yallop by seven wickets and so rained on the parade of the good burghers of Brisbane who were celebrating 50 years of Test cricket in the city. 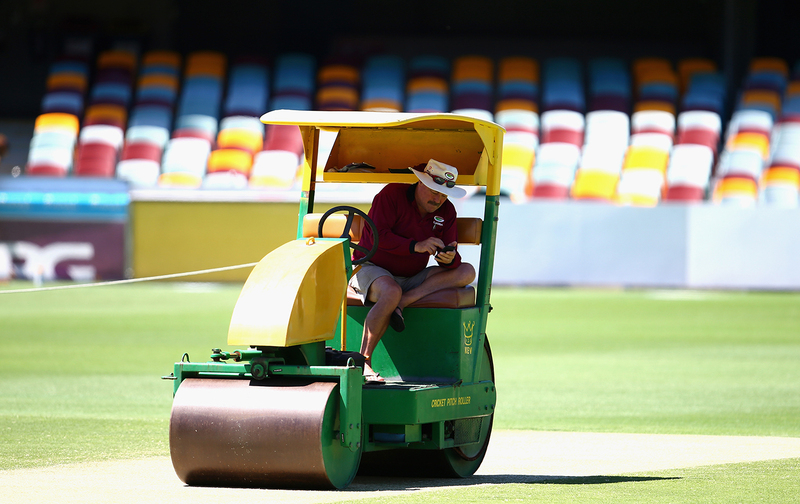 While the pitch block and outfield have remained much the same since Mitchell Sr began his toil 42 summers ago, the Gabba itself has undergone profound change. Indeed, this very modern if unremarkable cauldron with its multicoloured seats giving the constant illusion of a bumper crowd, is unrecognisable from its rustic predecessor. For all its shortcomings the old Gabba had its peculiar charms as well as its oddities - none more than the encircling greyhound track that was installed in 1971-72 and remained a novelty feature until its removal in 1993. Throughout this period the world's foremost cricketers would emerge from the veranda of a modest clubhouse, step down and cross the greyhound track to a small wire gate behind the sightscreen and, in spiked boots, gingerly negotiate two concrete steps to reach the outfield at straight hit. The last man onto the field was expected to shut the gate, as were batsmen when they made their way to the middle. The veranda - the setting for the memorable 1960s photograph of Bradman and Richie Benaud propped on wooden benches, discussing the state of the game over cups of tea - led from the players' dining room. So modest were the ground facilities, the dining room was regularly appropriated by officials for other purposes, most notably post-match press conferences. Given that so many series are shaped by events in the opening Test, visiting captains are often deflated and terse as they deconstruct questions from a demanding and sometimes hostile media contingent. As the record clearly shows, Australian captains are invariably buoyant and optimistic and generally at pains to avoid any suggestion of complacency or accusation of triumphalism. Still, one of the most dramatic events in Australian cricket history was played out in the room on November 26, 1984, when the country's 37th captain, Kim Hughes, tearfully announced his resignation after an eight-wicket defeat by West Indies - the fifth in seven Tests against Clive Lloyd's mighty team in nine months. In the same room six years earlier, his predecessor Yallop spoke of his satisfaction at becoming the first Australian to score a century in his debut Test match as captain. So unconventional and relaxed was the Gabba Test during the 1970s and 1980s, it was not uncommon after the first day's play for cricket writers to leave their cramped eyrie and join players and officials at a barbecue in the Queensland Cricketers' Club, adjacent to the pavilion. Indeed, cricketers and critics often would take their tucker on to the dog track and chew the fat or the rag along with the chops and sausages - a convivial association beyond the comprehension of today's scribes. Elementary and unsophisticated it might have been with its basic grandstands and infamous Hill of wit and wickedness, but the Gabba of the 1970s and 1980s had its ardent admirers. Prominent among these is Jeff Thomson, who bemoans many of the changes to the now floodlit stadium, which is home to Brisbane Lions in the Australian Football League and has been adapted as a concert venue. "There is no difference to the deck but the other changes have been extreme," he says. "It is nothing like the old small ground. It's all concrete and the wind doesn't get in and it is so hot." Geographically Australia is so vast, the very notion of federation often is obscured by a parochialism that is especially evident in Queensland. Gabba crowds are fiercely proud of their own and loud in their acknowledgement of them. They are also devoted to their most eminent adopted sons: Thomson, Border, Greg Chappell, Usman Khawaja, even Kepler Wessels and Ian Botham when they were not directly opposed to Australia. The passionate support for Thomson was never more evident than when he was first paired with Lillee in the last week of November 1974 and was immediately embroiled in an epic battle with England's Tony Greig. The garrulous Greig famously scored a brave and defiant 110 but Thommo took the glory and the headlines with match figures of 9 for 105. A legend was born. Given that he was reared on his father's tales of Thomson and company, it is unsurprising that Mitchell Jr has such admiration for the fast men. When he joined the ground staff as an assistant to his father in 1984-85, the peerless West Indian quartet of Malcolm Marshall, Michael Holding, Joel Garner and Courtney Walsh rampaged across the country. "I just thought: what a great place to work," says Mitchell - a sentiment he habitually expressed for the next 33 years. Mitchell was still hanging on his father's every word when Richard Hadlee gave a masterclass for the ages in 1985-86. Forever jockeying with Marshall, Imran Khan and Kapil Dev for recognition as grandmaster of pace and swing, Hadlee humiliated Border's Australians with match figures of 15 for 123. While pace bowlers prosper, so does anyone else with the skill and strength to extract bounce, the most redoubtable of spinners included: Shane Warne, in consecutive seasons against England and Pakistan in the mid-1990s, returned match figures of 11 for 110 and 11 for 77. Inevitably, given the weight of expectation on the fast bowlers, there have been some notable missteps over the years. Two of Western Australian left-armer Chris Matthews' three Tests came at the Gabba two years apart, and on each occasion he was overwhelmed by the moment and soon faded from the national consciousness. In 2006-07, Steve Harmison's first delivery went straight to second slip and was called a wide as a record crowd of 40,000 roared with derision. At stumps on the first day Australia were 346 for 3. At the corresponding time four years earlier they were 364 for 2 after Nasser Hussain took leave of his senses and asked them to bat. That the exceptional achievements of bowlers have been consistently complemented by the deeds of top-order batsmen, and particularly specialist openers, is the ultimate testament to the quality of Mitchell's pitches. Unsurprisingly, given it is their happiest hunting ground, it is predominantly Australian batsmen who have thrived, and none more fearsome than Matthew Hayden, a Queenslander to his substantial core. And it was here that Hayden honed his visualisation technique. Mitchell Jr clearly remembers when he first saw Hayden in stockinged feet pad his way to the middle and assume a prayerful position where he would take stance the following day. Hayden's beseeching was spectacularly rewarded with four hundreds and a 99 at the ground, including two centuries against England in 2002-03. Moreover, he happily shared the skills required to flourish on "his pitch", where it is so challenging to drive early in an innings. Michael Clarke, Australia's 43rd captain, recalls: "Matthew taught me about playing straight at the Gabba and WACA. Play straight or horizontal, nothing in between." Clarke proved an exceptional listener and mentee and scored five hundreds here, as many as Greg Chappell and one more than Ricky Ponting. Gabba crowds have always been strident in their appreciation of dinky-di Queenslanders at the top of their game and Mitchell Jr's legacy is such that he will be feted whatever the outcome of the opening Test of the 70th Ashes series.